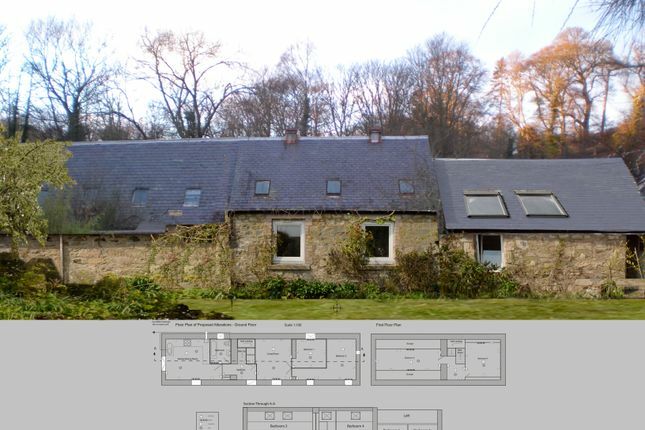 An existing barn with planning consent for change of use to residential property, providing a 4 bedroom house with garden and hard stand parking. Mill Cottage Barn enjoys an idyllic setting, surrounded by woodland and lovely walks yet within easy walking distance of the centre of the village and just a couple of minutes off the A68. Ancrum is a small and very pretty village, which lies on the St Cuthbert’s Way, just a few miles outside Jedburgh. The village enjoys an active community life and has a variety of local facilities, including a primary school, shop and post office, and a lively pub that serves real ale and good quality meals. The region is well known for its beauty and the lifestyle it offers, with many country pursuits, making the area an attractive and enviable part of the country to reside in. This location will appeal to those searching for a semi rural lifestyle, yet who need to have easy access to main routes and amenities. Already a comfortable commute for Edinburgh via the A68, the reinstatement of the Waverley Railway line, with the terminus in Tweedbank which can be reached in around 20 minutes by car, has opened up alternative travel options to the city and Midlothian towns, with travel time to Edinburgh Waverley Station from Tweedbank just under an hour. Newcastle and Carlisle are both about 60 miles travel by road. Travelling into Ancrum off the A68, drive over the bridge and keep right. On the bend where the road veers to the left there is a lane ahead; take that lane, signposted for Mill Cottage only, and the barn sits on the right. For those with the use of Satellite Navigation the postcode for this property is TD8 6XJ. There is an existing water supply to the barn. Mains electricity and gas are close to the site but not connected and drainage to be installed by the purchaser. The property will be assessed for Council Tax rating purposes upon completion. Strictly by appointment with the sole selling agents, Messrs Taits, 10 The Square, Kelso Telephone . Property descriptions and related information displayed on this page, with the exclusion of Running Costs data, are marketing materials provided by Taits, and do not constitute property particulars. Please contact Taits for full details and further information. The Running Costs data displayed on this page are provided by PrimeLocation to give an indication of potential running costs based on various data sources. PrimeLocation does not warrant or accept any responsibility for the accuracy or completeness of the property descriptions, related information or Running Costs data provided here.